Hanoi (Hà Nội), the capital of Vietnam (Việt Nam) with thousand years old of age, will never disappoint you because of its distinctive atmosphere, with West Lake (Hồ Tây), Hoan Kiem (Hoàn Kiếm) Lake, quiet cafes, street vendors and footpaths. Recent days, there are many airlines serving the route Saigon (Sài Gòn) – Hanoi (Hà Nội). You could refer the ticket price of the cheap airlines such as Vietjet Air and Jetstar Pacific. Vietnam Airline is better when it comes to quality but the price is also higher than the other domestic airlines. To move from Noi Bai international airport to the center area of Hanoi, you can take a taxi at the price from 400,000 to 500,000 VND. You could also take the transship bus of the two domestic airlines which are Jetstar and Vietjet with the price of about 40,000 and 50,000 VND/turn. 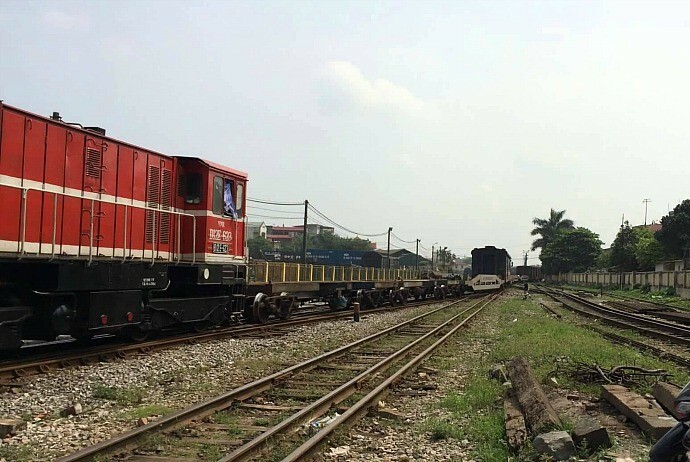 The price of Thong Nhat Bac Nam (Thống Nhất Bắc Nam) train ranges from 1,166,000 VND/turn to 1,246,000 VND/turn. From Ha Noi Railway Station located on Le Duan (Lê Duẩn) street to the city center, it takes about 10 to 15 minutes by taxi. In Hanoi, one of the uique features of Hanoi tourism is Hanoi Old Quarter cyclo. Many tourists visiting Hanoi chose this means to visit and explore the ancient beauty on every street in the middle of the a busy and bustling Hanoi. If cyclos bring the ancient feature of Hanoi, the electric car is a means of “green tourism” which is very modern and new to Hanoi tourism. 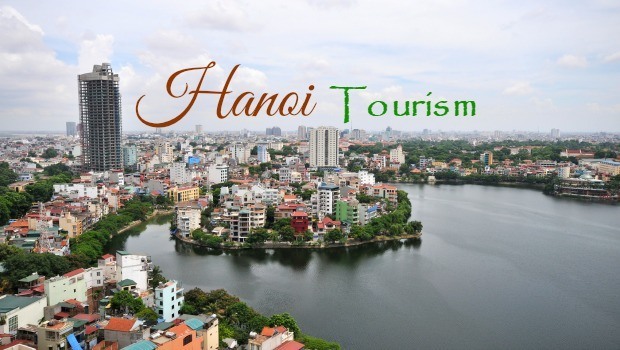 You wil ldiscover a civilized and polite Hanoi on the way of your trip. The special geographical feature of Hanoi is that there are many lakes in the heart of the city and many large river surrounding the city. 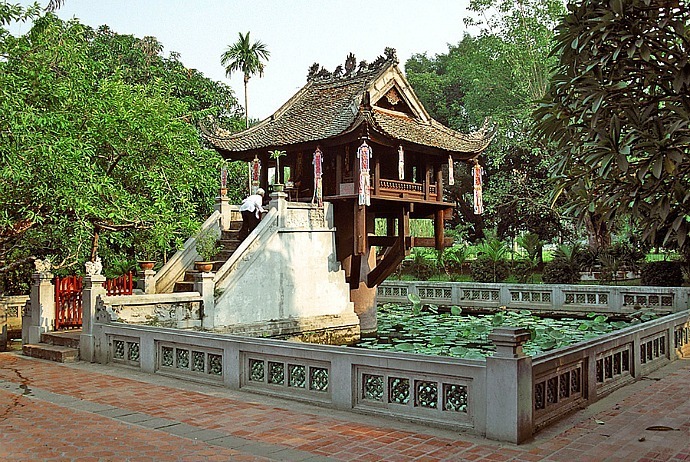 Hoan Kiem Lake is located in the city center with turtle tower located on a small peninsula in the middle of the lake. Next to Hoan Kiem Lake is impressive buildings – the precious heritage of the city: But Tower (Tháp Bút), Nghien tower ( đài Nghiên), The Huc (Thê Húc) bridge leading to the Dac Nguyet upstairs (Lầu Đắc Nguyệt) or Tran Ba (Trấn Ba) temple…. on the way to Ngoc Son (Ngọc Sơn) temple. Hanoi is the religious center of Vietnam, mainly Buddhist so in the inner city, there are many temples with hundreds of years old. The most famous is the One Pillar Pagoda having a lotus-shaped architecture which is considered as the most unique in Vietnam. It is also the place not to be missed when traveling in Hanoi. In addition, there is Tran Quoc (Trấn Quốc) pagoda, the ancient pagoda built in the reign of King Ly Nam De (Lý Nam Đế) (in the 6th century). 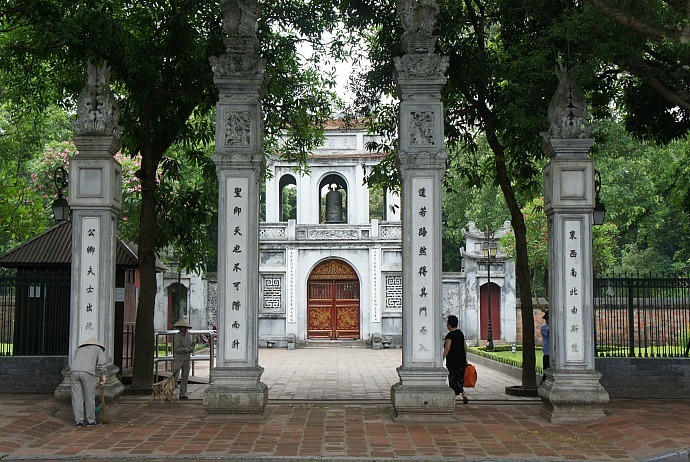 This is a shirne to Confucius, where the doctorate steles were put and also the first university of Vietnam. Today, Van Mieu – Quoc Tu Giam becomes a popular destination of tourists when visiting Hanoi, where the students having outstanding achievements are awarded certificates. Pupils and students often come here for good luck before each exam. 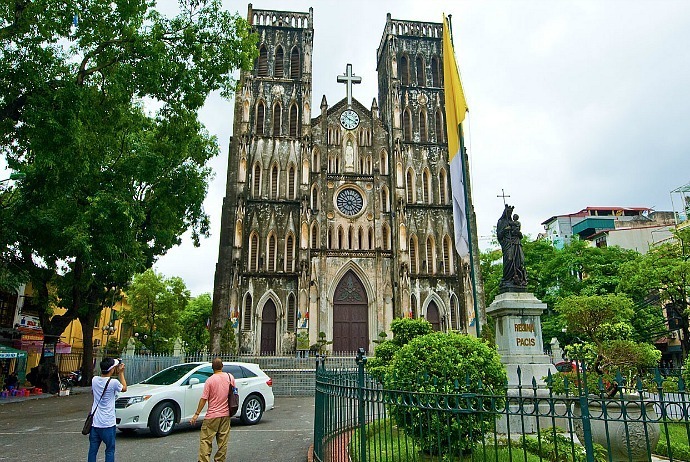 The typical architecture of Hanoi, Hanoi Cathedral, has an airy and pleasant space, making it an attractive destination for Hanoi youth and tourists. Each morning, sitting on the sidewalk cafes and comfortably enjoying the chilly weather of Hanoi will bring to you a memorable experience. In the evening, gather friends to gossip next to the lemon tea cups. The highlight of Hanoi tourism is the Old Quarter. 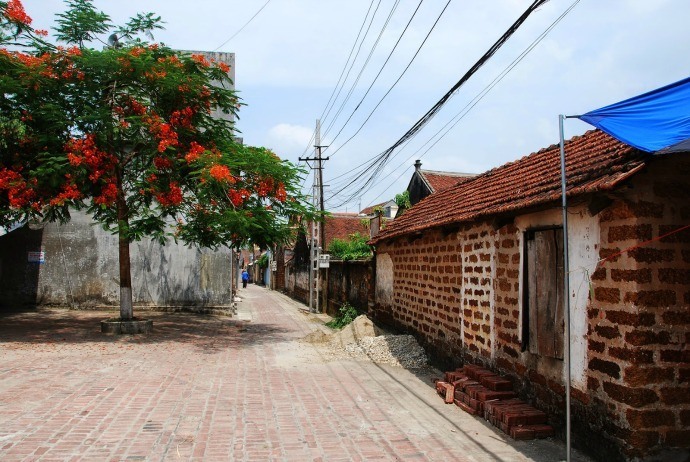 36 streets of this area with ancient houses and streets still retain their look from the 19th century. You could wander all day long on those ancient streets, explore peaceful and homely place of Hanoi. Visiting this place, you will feel the beauty of Hanoi residents, who are very friendly and close. This is a smaller version of the Opera Garnier in Paris. 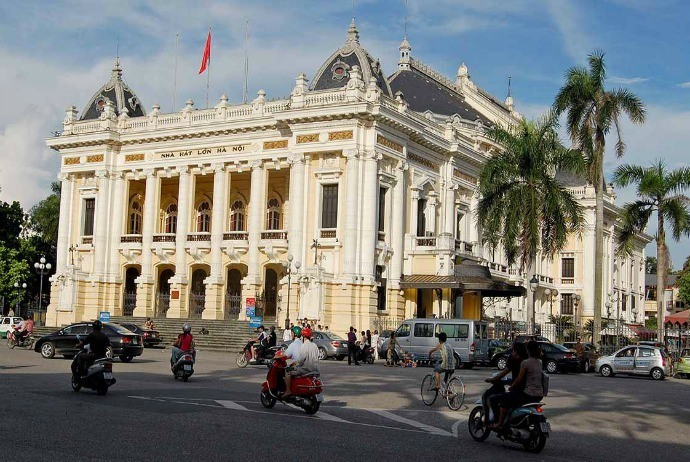 Located at no.1, Trang Tien (Tràng Tiền) Street, the central street of the city, the Opera House was the place where many important events of the country were held. Visiting Hanoi, it is indispensible to ignore the political center of Vietnam with the Parliament, the Presidential Palace, the historic Ba Dinh (Ba Đình) Square, where Ho Chi Minh (Hồ Chí Minh) read the Declaration of the independence of Socialist Republic of Vietnam. Ho Chi Minh Mausoleum is the place keeping his corpse. This mausoleum opens 5 days per week, on Tuesday, Wednesday, Thursday, Saturday, and Sunday mornings. Visitors must comply with the requirements of formally dressing up, not bringing electrical equipments and keeping order in the mausoleum. 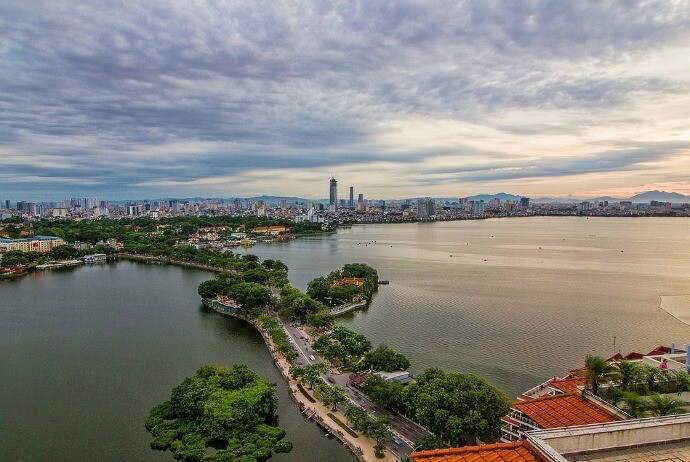 Located not far from the city center, West Lake is the largest lake in Hanoi. You could rent a water bike or take a boat trip around the lake. The best time to visit West Lake is at sunset. 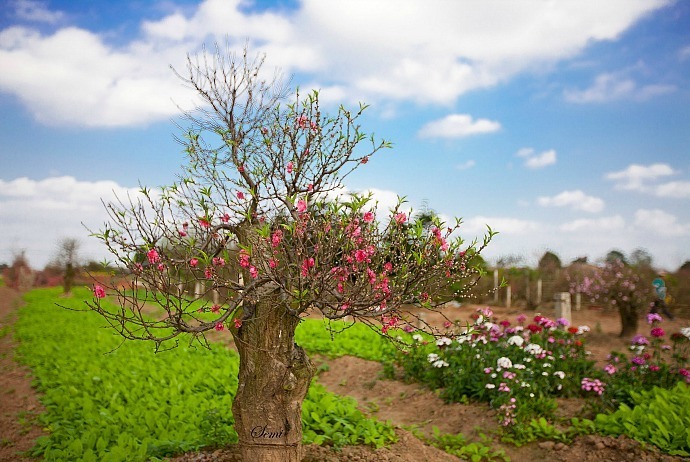 Adjacent to the lake, there is an old village named Nghi Tam (Nghi Tàm), which retains the elegant hobbies of old Hanoians, such as bonsai and decorative plants. Nghi Tam is also called as the flower village. In every spring, this village is be filled with colors of fresh flowers. Near West Lake, there are Ngu Xa (Ngũ Xá) village with the traditional industry of bronze casting, Yen Phu (Yên Phụ) village with the craft of making incense. They are both worth-visiting places when traveling in Hanoi. 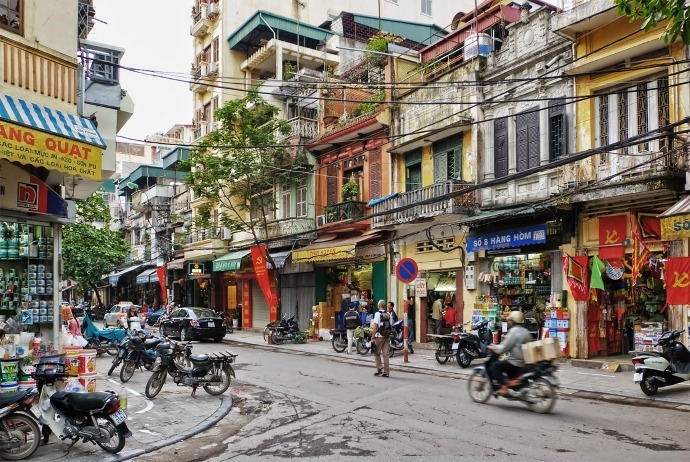 If you visit Hanoi for the first time, you should live at least once in the middle of an old Hanoi with ancient roofs nestled adjacent to the modern apartments and buildings. Wandering in a hotel around the Old Quarter, or stopping at a hotel in Hoan Kiem District will give you the thoughtful feeling of the ancient feature which is not easy to find in anywhere else. Bat Trang Pottery village is about 20km far away from the city center, located at the left bank of the Red River. You could go by motorbike or bus to reach this village. 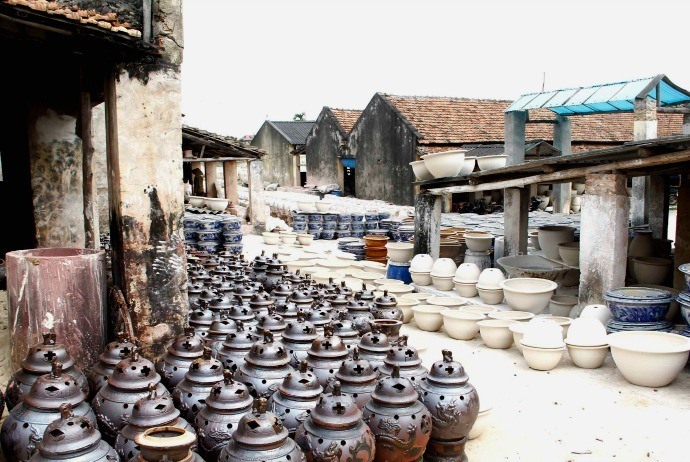 For generations, Bat Trang is famous for quality pottery throughout the country. You could go around the village, there are many ceramic workshops; the streets around the village are unique coal drying walls and rustic old houses. If visiting here, you could walk to the riverside area, there is a unique means helping you explore Bat Trang in a comfortable way, which is “cattle car” (xe trâu). In the small pottery workshops, you could manually make ceramic products or draw on the ceramic cups or souvenirs to give to friends and relatives as presents. The price of a readily available ceramic product is from VND 10,000 to 30,000. This is the ancient Vietnamese village which still remains the unchanged tangible and intangible value about the lifestyle of the ancients. Tourists visiting here also enjoy a traditional lunch in the courtyard of an ancient house, or listen to the story, visit the mossy walls. The most interesting thing is hiring a bike and cycle around the village. This is also the place launching a lot of extremely beautiful photos. 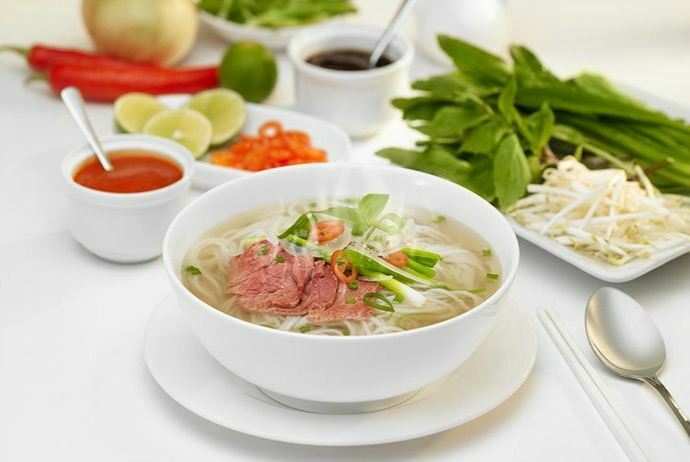 Noodle, also known in Vietnamese as Pho (Phở), is a not to be missed dish when traveling in Hanoi. Pho in Hang Trong (Hàng Trống) street is famous with sidewalk vendors; there is no table but customers just need to sit on small chairs and enjoy bowl of pho in a delicious way. An interesting thing is that this pho restaurant only sells in the afternoons with the price of about 15,000 VND. The famous beef noodle restaurant is Pho Ly Quoc Su (Phở Lý Quốc Sư). 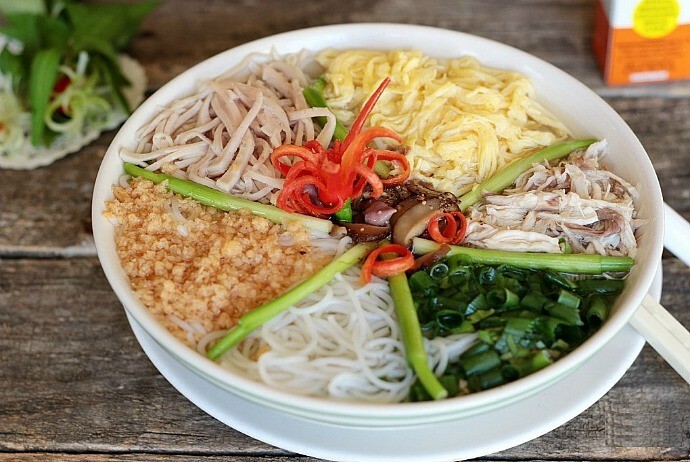 If you want to eat chicken noodle, you could go a restaurant on Quan Thanh (Quán Thánh) street. Enjoy the exotic mixing noodle with sweet, sour taste at Pho Hanh (Phở Hạnh) located on Lan Ong (Lãn Ông) street or a restaurant on Luong Van Can (Lương Văn Can) street. Do not skip sautéed Pho on Bat Dan (Bát Đàn) street. If you do not enjoy Pho, it means you have not ever set your foot here. Fish is fried on a little pan of oil; each table will have a small charcoal stove with the pan of fish put on top. Fish is served with toasted bread, rice noodle, along with peanuts, cilantro, basil, fresh chopped onions dipped into shrimp sauce. Shrimp sauce must be prepared by adding squeezed lemon, pepper and then being beaten up before being added with white wine, a little fat and sugar water. The dish is sweet and fatty. This is one of the best foods to eat in Hanoi and Vietnam as well. Pretty baked small pieces that are slightly scorched have tangy taste of marinated spices, served with sweet and sour fish sauce containing garlic, vinegar, pepper, aromatic pepper and green papaya cut into small pieces. Noodles and some raw vegetables, particularly perilla, are other main ingredients of this dish. 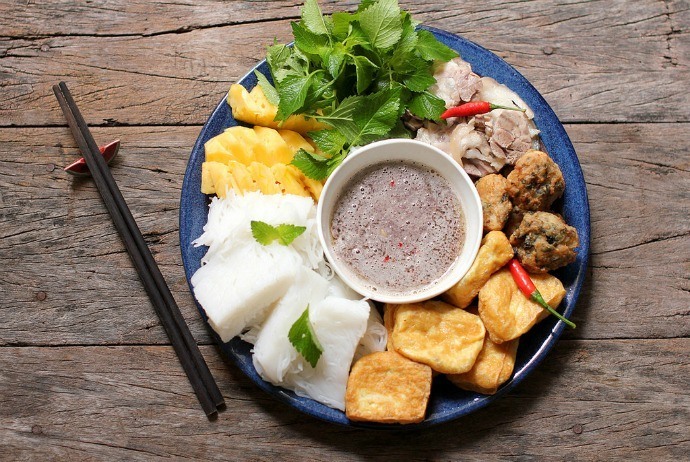 This is a dish containing the essence of Hanoi cuisine. Bun Thang contains many ingredients such as shredded chicken, fried eggs, Lua sausage (Chả lụa)… The broth is created by simmering pork bones, prawn. A delicious pot of broth must be clear and gently fragrant, and include a little spicy flavor which is shrimp sauce. The most delicious Banh Com is at Nguyen Ninh (Nguyễn Ninh), no.11 Hang Than (Hàng Than) street,Hanoi (Hà Nội). So far, this store has still sold Banh Com with the ancient traditional recipe. 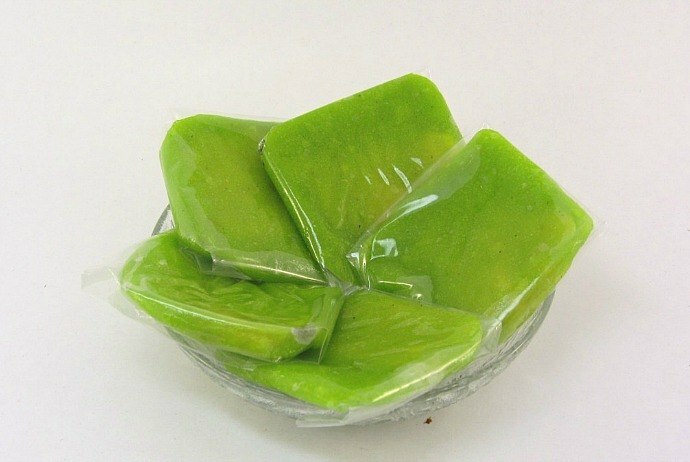 Banh Com with fresh green color, a thin cover which can allow you to see the stuffing made from mung bean inside, and the fragrant smell of green rice blended with greasy smell of coconut and green beans, creates such a perfect combination that tourists just smelling alone are also intrigued. 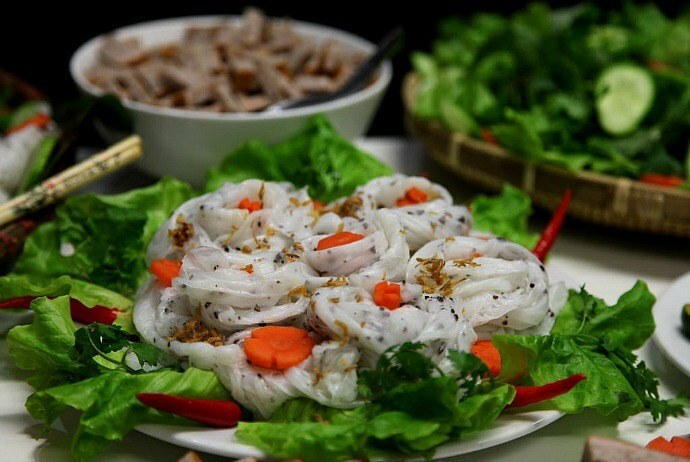 Hanoians love dainty food that is less greasy, and banh cuon is one of such typical dishes of Hanoi. Rice for making the dish must be carefully selected and then ground into flour before being mixed with the water and processed on the stove as thin layers. After being removed from the stove, roasted pork and mushrooms will be sprinkled on top and then the cake will be rolled before being added with some salted shredded shrimp meat. The dish will be served with fish sauce and meat pie. 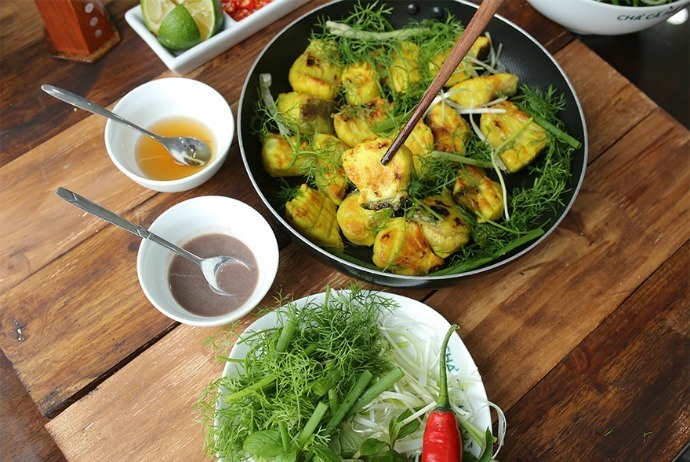 This becomes a dish that any traveler to Hanoi would love to taste once in a lifetime. Bun Dau Mam Tom is suitable for all seasons and can please everyone. Hot fried soya cakes will be cut into pieces and fried into those with golden friend outer layer. The most important ingredient of this dish is shrimp paste which then will be added with a little squeezed kumquat juice and whipped well, followed by some hot grease. 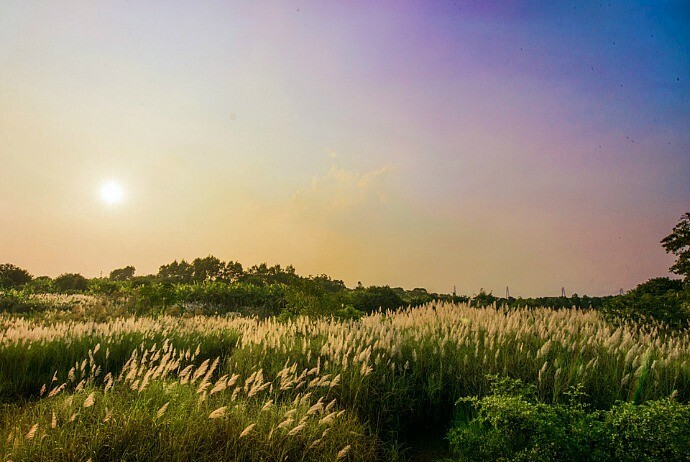 Located on Au Co (Âu Cơ) street, Tay Ho (Tây Hồ) District, Nhat Tan flower garden not only attracts young people to come and watch vast garden of colorful flowers in spring festivals, but also in any day of the year, this is an ideal place for the youth to visit and take great photos. Located at the end of To Ngoc Van (Tô Ngọc Vân) street in Tay Ho (Tây Hồ) District, West Lake lotus pond is an ideal place for young people to enjoy and photograph every lotus blooming season. 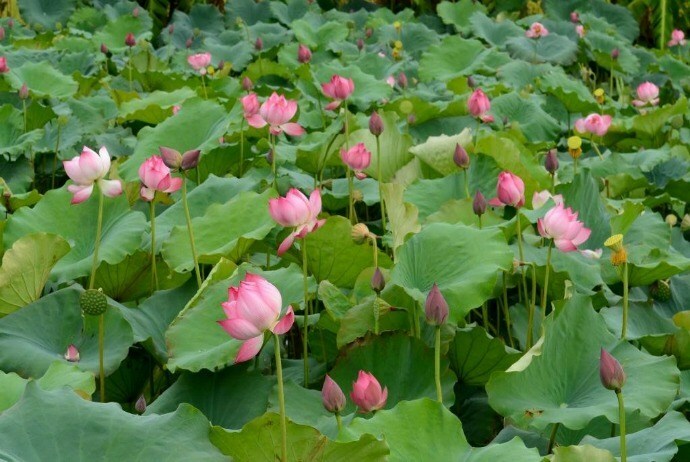 Each season of lotus blooming, the youth, particularly girls excitedly invite each other to go to this lotus pond to take great photo albums, having the shades of Hanoi ancient women with graceful ao dai or Viet-style brassieze with bare back. This is the first university of Vietnam and also the single feudal university that still exists until now. Van Mieu Quoc Tu Giam is a pretty familiar place of taking photos in Hanoi for students who want to save the memories of their impressive student life. 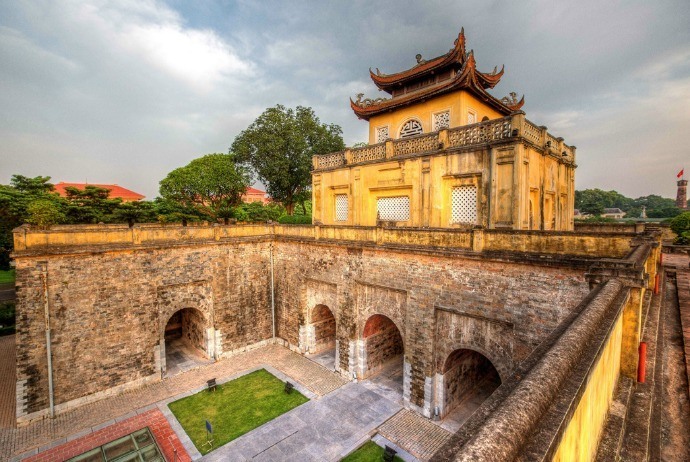 Located on Hoang Dieu (Hoàng Diệu) street, Thang Long (Thăng Long) Imperial Citadel, along with Van Mieu Quoc Tu Giam, is a favorite destination of many tourists. With the spacious and airy space, having green grass layer in front of the historical relics of Hanoi is a wonderful setting for you to record beautiful moments in Hanoi. Situated in Tu Liem (Từ Liêm) District, Hanoi, near Hanoi Industrial University, Tay Tuu flower village is known to be the largest flower village in Hanoi. It is a nice place in Hanoi for photography due to vast fields of flowers such as roses, chrysanthemums, lilies… which are picturesque. You will be able to take photos without having to pay fees, as long as not to damage the flowers of the local families. Visiting Tay Tuu flower village, you will feel immersed in a fragrant atmosphere with colorful scene of countless flowers. Particularly, the price of fresh flowers sold right at the garden is very cheap, you could buy flowers for decorations or planting. 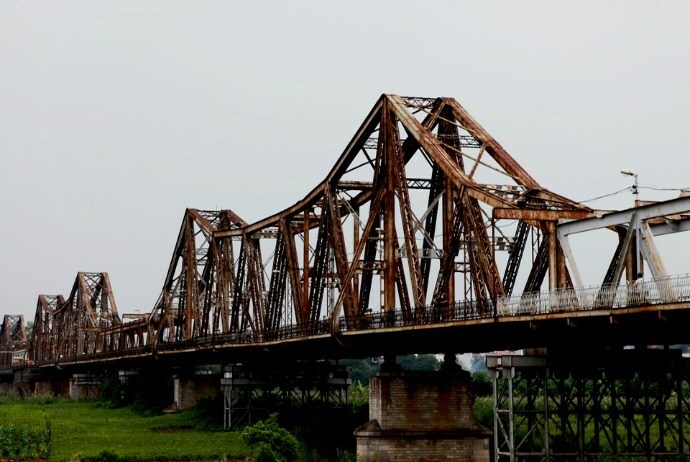 Not only is a historical witness, that connects two banks of the Red River, Long Bien Bridge is also a bridge between the simple, peaceful life of people in Red River middle ground and the noise and bustle of the urban life. With ancient, idyllic features, Long Bien Bridge has become one of the beautiful places in Hanoi for photography that are ideal for the youth and couples for taking the best shoots. Red River Middle Ground is a familiar name of the alluvial fertile strip of land emerging in the heart of the Red River. The river runs through Hanoi and is a beautiful place that young people love to go to photograph. From Long Bien Bridge, looking down, you will see a completely different Hanoi differing from the hustle and bustle of urban. Red River beach is blessed with stretching sandy grounds along with white cane-brakes swaying in the wind gently, the green bananas on the sidelines, creating a rustic, peaceful but fresh scene. Hoan Kiem Lake and the Old Quarter are places which are impossible not to mention when it comes to beautiful places for taking photos in Hanoi. 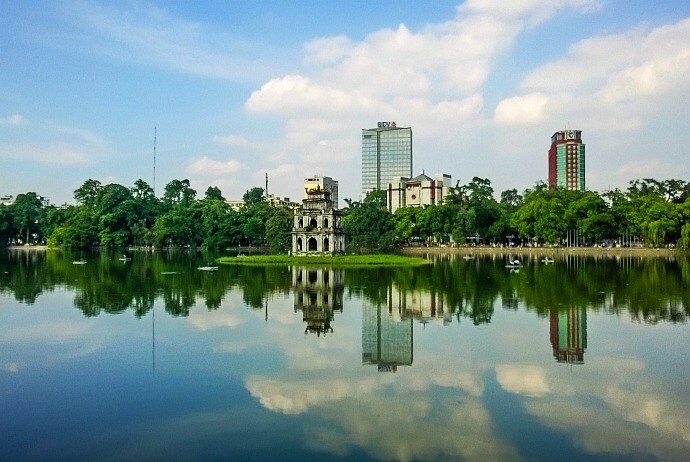 The Hoan Kiem Lake area is a place selected by the youth and tourists to capture the moments of the thousand year of civilization capital. It is also a place for couples to take wedding photos. The Old Quarter is not only a famous tourist destination for its ancient pavilion, craft products, but also a place for tourists and young people to come to save the pictures of ancient, gentle, and rustic features of Hanoi. Located less than 15km away from the city center, Yen Vien station is a beautiful location for photograph in Hanoi which is particularly ideal for young people. The special thing about this station is the very long rails and trains creating a romantic photography scenery.